How Your Warehouse Storage Can Benefit from Mezzanine Installation | S. W. Betz Company, Inc.
Mezzanines are simply one of the best ways to maximize warehouse storage. Mezzanine installation, when completed by a knowledgeable company like S.W. Betz, is one of the top additions any warehouse can make. Below verifies the many ways mezzanine installation can benefit your facility. You may need or desire a mezzanine for reasons other than simple warehouse storage. They work great in multiple facilities which may utilize them for office or employee space and other departmental needs. Whatever you need more space for, mezzanine installation works in your favor. You aren’t utilizing all available warehouse storage space if you’re not ‘building up’. Mezzanine installation provides multiple levels of storage from the space available between the floor and roof of your facility. Without mezzanines, and with a need of additional warehouse storage space, your options include renting a new facility or constructing a new building. This is extremely expensive and unnecessary with mezzanines, which utilizes the large amount of space available with their installation. However, mezzanine installation is not for the novice. To install a mezzanine warehouse storage system correctly, you need an experienced team who is knowledgeable in the set-up of this equipment. An experienced team will know all the proper safety precautions, and be able to answer any questions you may have about your new system. If your Baltimore area facility or warehouse is ready to reap the benefits of a mezzanine system, let the professionals at S.W. Betz know. You’ll have a safe, sturdy mezzanine system—guaranteed. The S.W. Betz Company, Inc. has been providing businesses in Maryland and beyond with all of their essential Weighing, Material Handling, Dock, and Warehouse equipment since 1933. 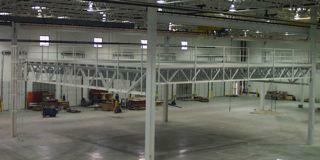 We also assist customers with mezzanine installation and other warehouse equipment. We carry a variety of top warehouse equipment brands, such as: Morse, Wesco, Magliner, and Quantum Storage Systems. S. W. Betz is also a preferred supplier of Cogan, a leader in the manufacturing of mezzanines and other material handling equipment. This entry was posted on Tuesday, January 12th, 2016 at 7:31 pm. Both comments and pings are currently closed.